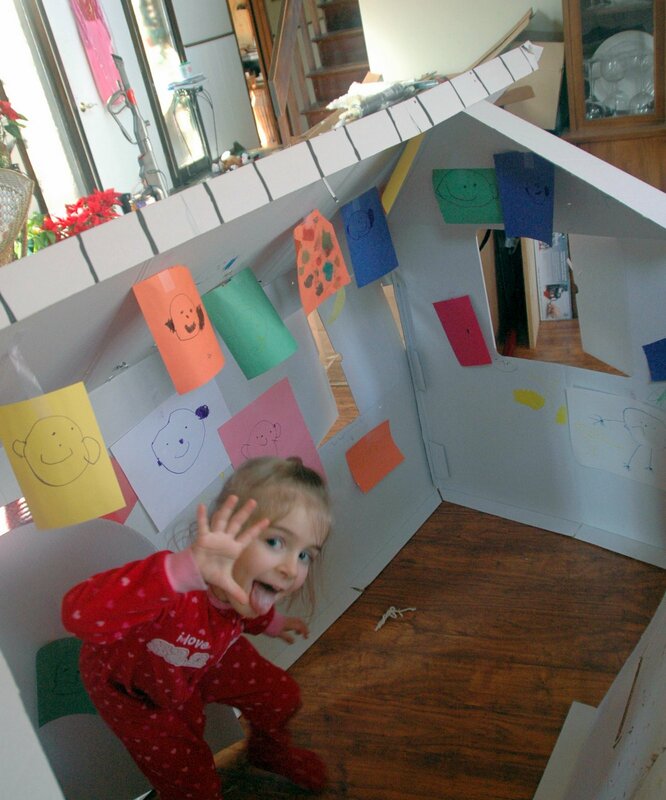 Blanket forts, tree houses, tucked away closets…it’s obvious that the kiddie crowd loves to have places and spaces to call their own. Claire is no exception. 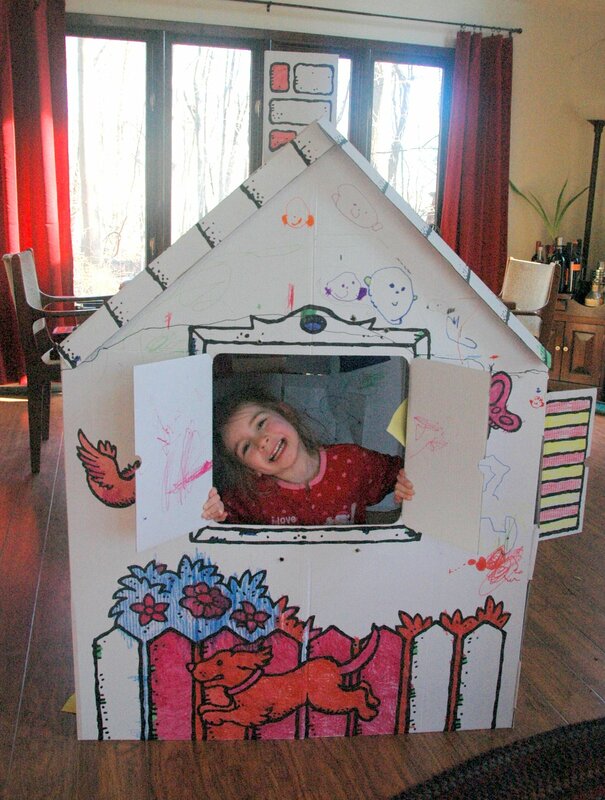 Santa dropped this cardboard house off at Christmas and for the following 4 weeks Claire meticulously colored and embellished it in her own style. Now if you’ve spent any time at all here at the blog, you know I’m a “color outside the lines” kind of gal so picking up this house was a little out of character for me. But I am so glad I did because Claire loved it (and I was able to bury my nose in a bunch of books for hours at a time – BONUS!) 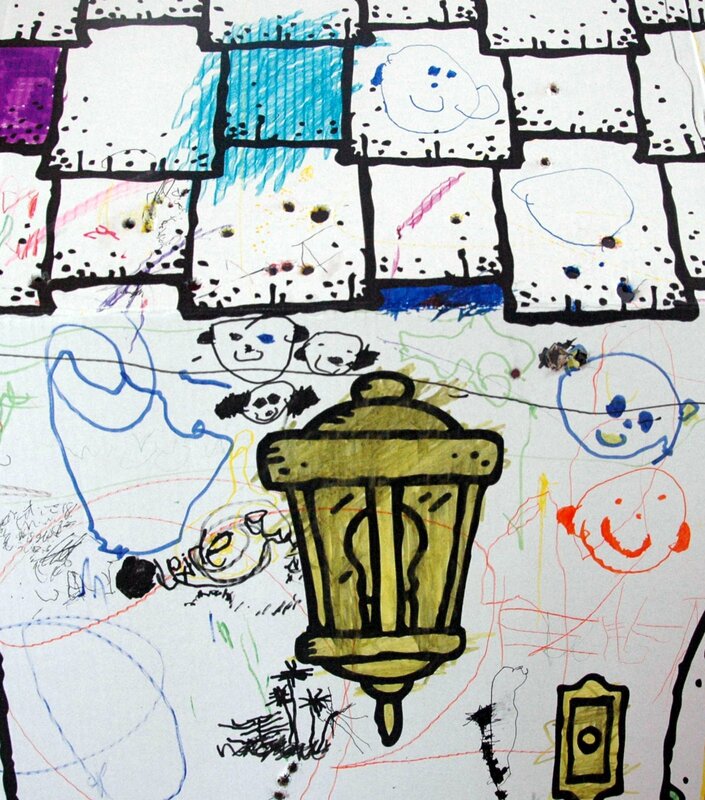 I dubbed this “Happy Monkey House” because all over the outside of the house Claire drew happy smiley monkeys. These are quite different than her people drawings, a keen eye will notice the pronounced monkey ears (often colored in). 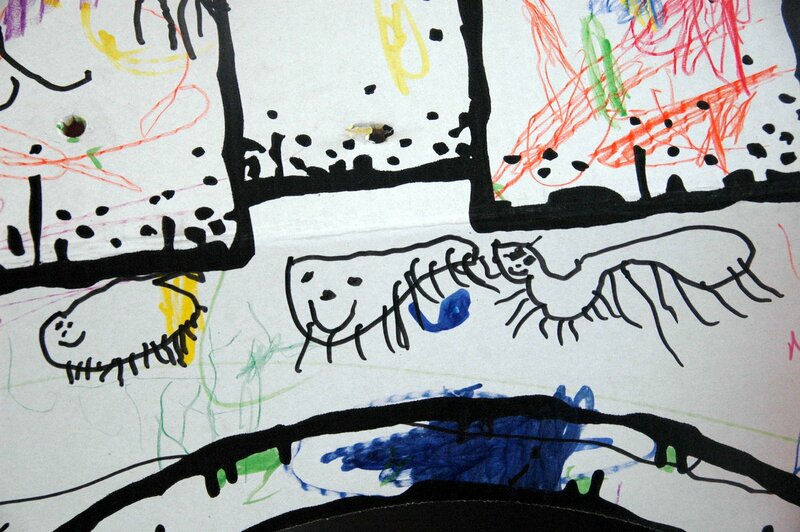 A friendly family of millipedes live over the door (I’m sure this is my fault). their full glory. Future architect? But by far the most interesting of modifications are Claire’s skylights. 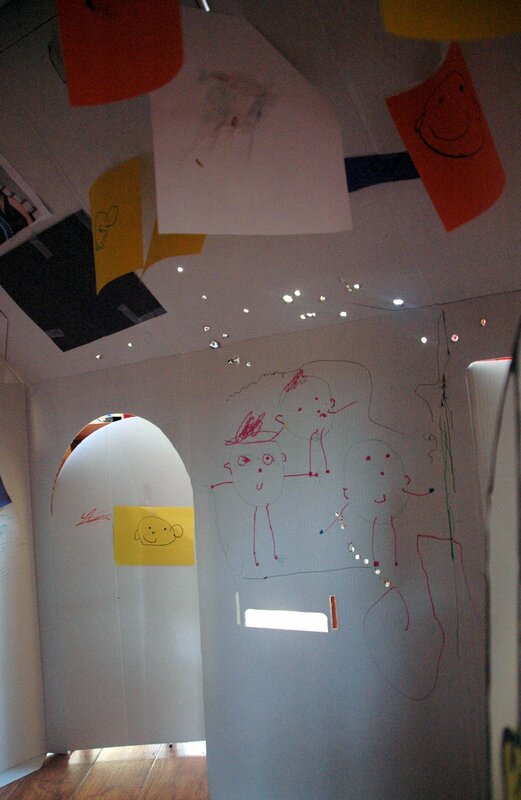 Yep, it was dark inside the house so Claire punched an assortment of holes in the roof to let more light in. Like I said, I had my nose buried in a book…apparently she did this very quietly. 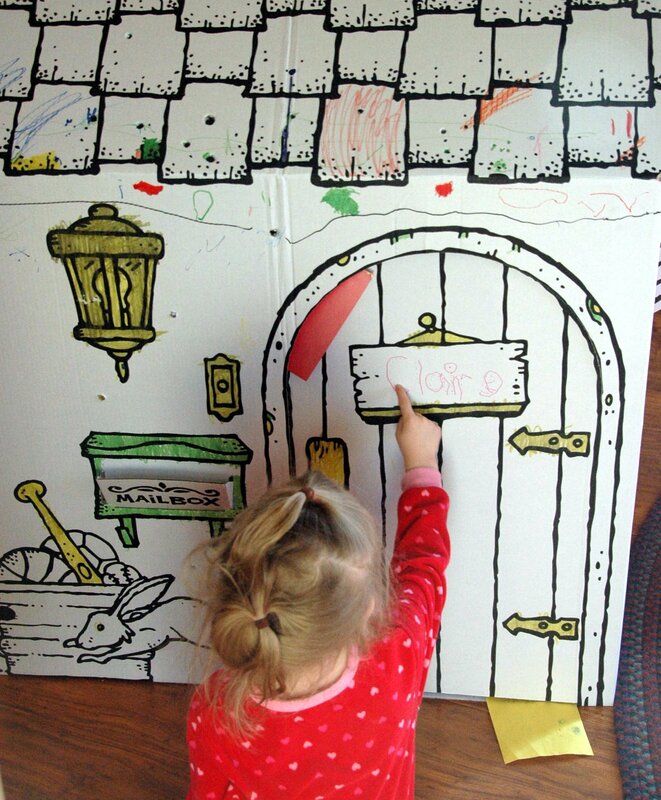 Speaking of things to see, when not coloring the outside scenery, Claire was hard at work decorating the interior of the cottage. You guessed it, more monkeys. There’s one frown-faced fellow in there and a picture of Dan and I even made it in (I feel honored). Happy Monkey House is stowed in the basement right now. After giving up half the living room for nearly a month I’ve reclaimed the space but I’m sure we’ll bring it out again. All of the monkey portraits that hung from the ceiling have a new home too but you’ll have to wait to see it! I couldn't be happier stumbling upon this page. I thought I was only searching for skylight prices in brisbane but what I came across here is so much more priceless! Imagine the artistry and creativity of that kid. Gives me the goosebumps and the tears. Awww….